Francis Bacon's style is that of a figurative painter bordering on the abstract. He was a magician at conjuring up the tension between two people on the canvas. He produced disturbing, but at the same time comical paintings. The way he fuses the anatomical bones to the hanging flesh, suggests he studied Gray's Anatomy whilst high on something. But we do know that he owned & took references from Eadweard Muybridge's photographs on movement & was obsessed by pictures of diseases of the mouth. Hence the human scream, a distorted representation of flesh done in a very sculptural form. The canvas format he used was 14x12 inches or 78x58 cm, usually a highly coloured background, Cadmium Red, Cadmium Yellow or Prussian Blue. I first came to like Francis Bacon's paintings in the early 1970s & by the late 1970s I was hooked. The paintings seem to hit directly into the nervous system. I did actually meet him in the 1980s. I say meet; I really bumped into him in Old Compton Street in London's Soho. We just stood & stared at each other without saying anything. He had this enormous jaw & cheeks almost like a hamster's. I've often drawn & painted him, but there's a critical moment in the process where the balance is easily tipped into caricature. So here I was practically standing nose to nose with my favourite painter, & what did I say to him? Nothing. This chance meeting was made all the more coincidental because only a few hours earlier I had bought a book about him. Anybody else would probably have asked him to sign it, but he could be a bit unpredictable & was likely to tell me to piss off if the mood took him, so I declined & moved on rapidly. I recommend two books below that give an insight into Francis Bacon. 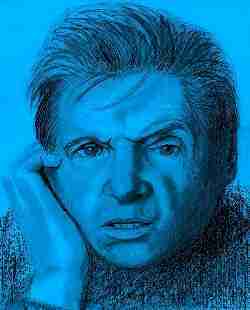 For a brief biography of Francis Bacon see the Biographical Notes page. An oil painting of Francis Bacon by Maggi Hambling can be seen in the Sands Gallery at the Ashmolean Museum in Oxford. You can see more than forty of Bacon's works online at the BBC 'Your Paintings' website. The show explores the influence of both French and Spanish cultures in Francis Bacon's art. Clicking on a linked title or image below will take you to the book's entry at Amazon.co.uk. To find these titles offered by Amazon.com in the USA, and other recommended Bacon books go to the Well Furlong Francis Bacon bookshop page. There you may link to the books at Amazon.co.uk or Amazon.com. This is a gloriously gossipy biography. Farson was Bacon's friend and confidant for over forty years. He captured Bacon's viciousness and generosity. He could annihilate with one sentence or even a word. In his art Bacon strived for the creative accident. The official website of the estate of Francis Bacon. In 1998, this Dublin gallery secured the donation of Francis Bacon's studio from the artist's heir John Edwards and Brian Clarke executor of the Estate of Francis Bacon. In the August of that year, the Hugh Lane team removed the studio and it's entire contents from London to Dublin. You can see forty or so of Bacon's works online at the BBC 'Your Paintings' website.